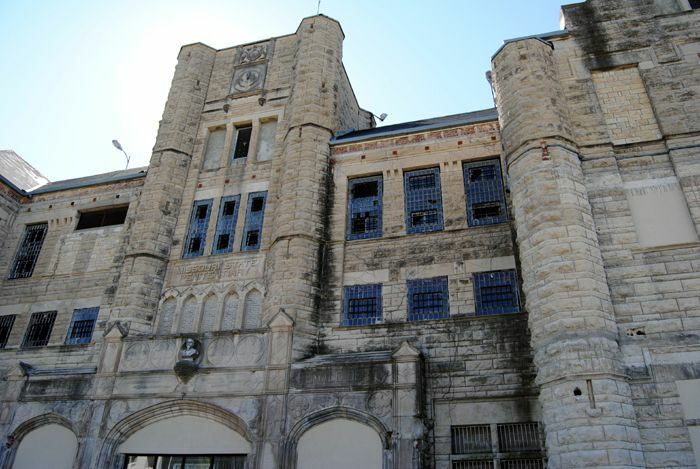 Once called the “Bloodiest 47 acres in America”, the Missouri State Penitentiary in Jefferson City was the oldest continuously operating correctional institution west of the Mississippi River when it closed. As such, it should come as no surprise that it is said to be haunted. 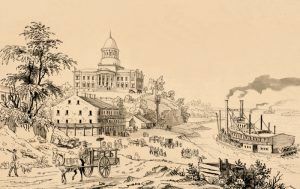 Jefferson City became the capital of Missouri in 1822, but in the next decade, there were other towns that were vying for the opportunity to take that status for themselves. 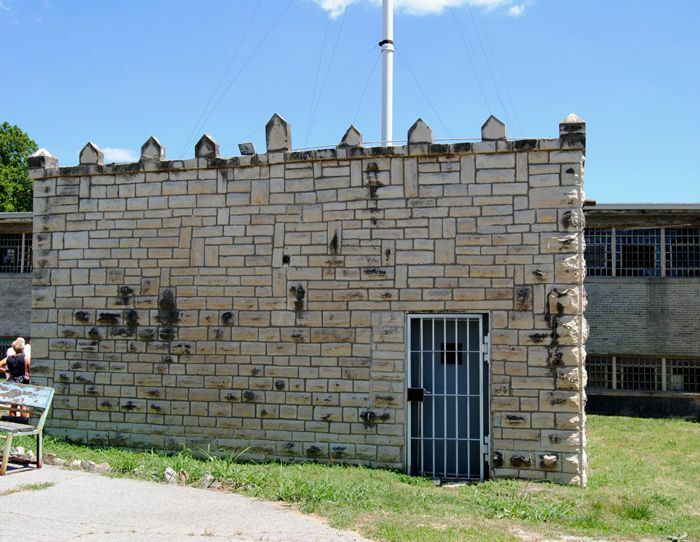 Jefferson City needed to do something to ensure that it would remain the capital city and Governor John Miller came up with the solution in 1831 when he proposed the construction of a maximum security state penitentiary. The prison was authorized by the Missouri Legislature the next year. Construction began in 1834 and opened in 1836, the same month that the Alamo fell in Texas. Initially, it housed just 15 prisoners who worked in a shop making bricks. 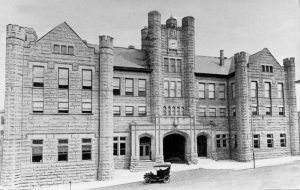 Missouri State Penitentiary in its early days. When the prison, nicknamed “The Walls”, was fully completed it was surrounded by a high limestone wall with 15 officer towers. 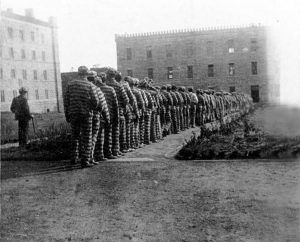 Before long, 2,000 men were incarcerated at the penitentiary, which would be the average number of inmates for many years. The prison admitted its first female inmate in 1842. 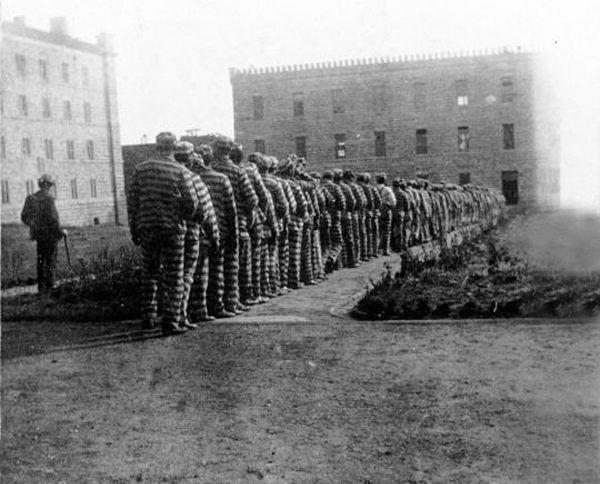 Early on, the penitentiary operated a lease program where businessmen could hire inmates to work for them. 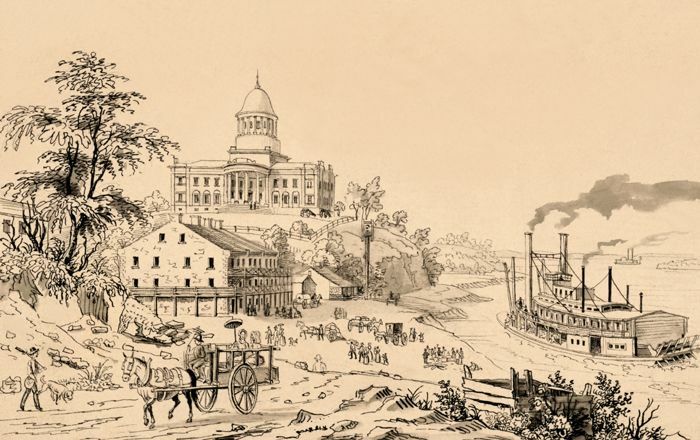 Several buildings in Jefferson City, including the first capital, the governor’s mansion, and several area homes were built using prison labor. In 1868, Housing Unit 4 or A Hall, was built to house post-Civil War criminals. Constructed of stone quarried on site and built mainly by inmates, it was designed by Warden Horace Swift and was in continuous use until the day the prison was closed. The massive stone building is the oldest building at the prison today and its basement, nicknamed the “Hole”, was a medieval-style dungeon that housed some of the worst criminals, including those on Death Row. Over the years, the prison became an industrial site and by 1885, it housed six shoe factories; clothing, broom, and twine factories; and the largest saddle tree factory in the world. All were worked by prison labor. Housing Unit 1 was constructed in 1905 to house female inmates. It now serves as the main entrance to the penitentiary. 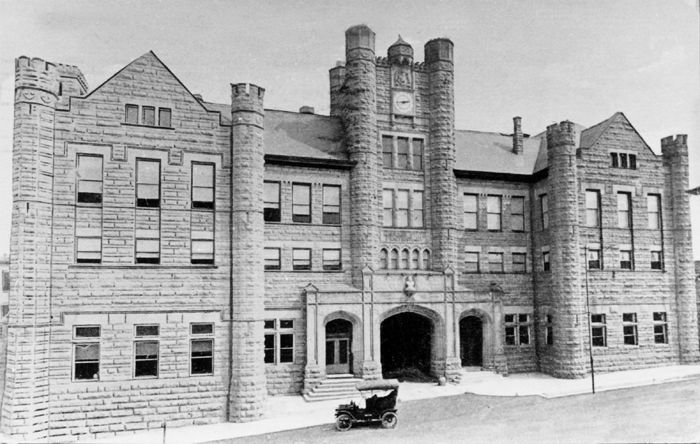 In 1914, the prison was expanded again with the addition of Housing Unit 3, which became the capital punishment and segregation unit. 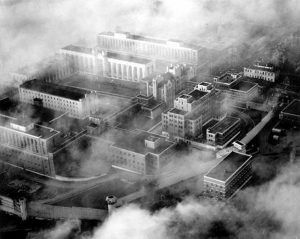 According to the Department of Justice, the prison housed 4,900 inmates in 1936. However, at its highest point, the facility housed 5,200 inmates, far more than it was designed to hold, and at this time, more inmates than any other facility in the country. In 1937, the prison gas chamber building was built by prison inmates using stone from the prison quarry. Before this, executions were conducted by hanging. The new gas chamber would become the location of 40 executions, which included the deaths of many infamous criminals such as Claude McGee, George Bell, and Bonnie B. Heady. Thirty-nine were executed in the gas chamber and the final execution was made using lethal injection in 1989. Afterward, the prison’s death row inmates were transferred to the Potosi Correctional Center in Mineral Point, Missouri. In 1938, a five-story hospital unit with 240 beds was added to the complex. Although many riots, murders, and escape attempts occurred over the years, one of the biggest events in the prison’s history occurred when a violent riot broke out in September 1954. In the previous two years, several other prison riots had occurred across the country and when gossip in the prison turned to talk of riots, authorities took it seriously, drafting a plan should such an event occur and training officers. On the evening of September 22nd, two inmates feigned illness and when two guards came to investigate, they were overpowered and one was beaten severely. The prisoners then stole their keys and released other prisoners. 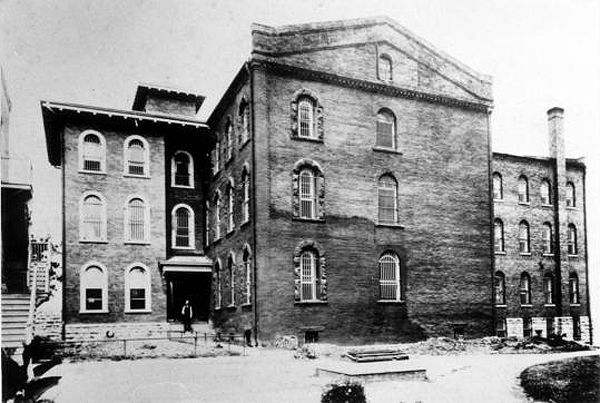 Before long, several hundred inmates were running loose throughout the penitentiary, smashing windows and furnishings, and setting fires in the prison shops. By midnight, the Missouri Highway Patrol, police from Kansas City and St. Louis, and national guardsmen had surrounded the prison. By that time, four buildings were on fire. Before it was over, nearly 2,500 rioters were on the loose inside the walls and the carnage continued through the night. The authorities announced to the press that there would be no attempt to secure the cellblocks that night, but rather, the lawmen were tasked to prevent a mass breakout. Early the next morning, 18 men were chosen to lead the way into the cellblocks where about 300 of the rioters were holed up in a forbidding four-story white stone building. Other armed troopers were on the roof and over 100 police officers were standing just outside the prison yard as a second wall of defense. 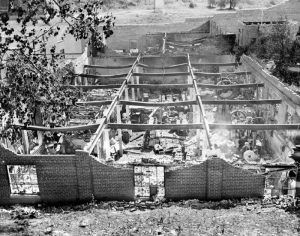 The officers on the roof were finally forced to open fire with machine and riot guns to remove convicts from the prison yard. In the meantime, the 18 men tasked with going into the prison building were heavily armed with riot guns and submachine guns. Upon their entry, they were bombarded with shouting, cursing, and articles being thrown at them. All of the windows had been broken out and the building was filled with four inches of standing water. Over the loudspeaker, the convicts were ordered to get into the nearest cell and be quiet or they would be shot. One inmate who ignored the order was killed and the rest retreated to the cells. Before the building was secured, as many as nine men were locked away in each cell. It would be mid-afternoon before the rioters were processed and everyone was returned to their cells. When it was over, four inmates had been killed, one of whom was in solitary confinement who was tortured and murdered by other prisoners. Another 50 inmates were injured and one attempted suicide. Four officers were also injured. No inmates were able to escape during the incident. The burned-out hulks of several buildings lay smoldering and damage was estimated to be $5 million. The riot started and ended in Housing Unit 3. Because of the violence in the penitentiary, it was called “the bloodiest 47 acres in America” by the Time Magazine in 1967. 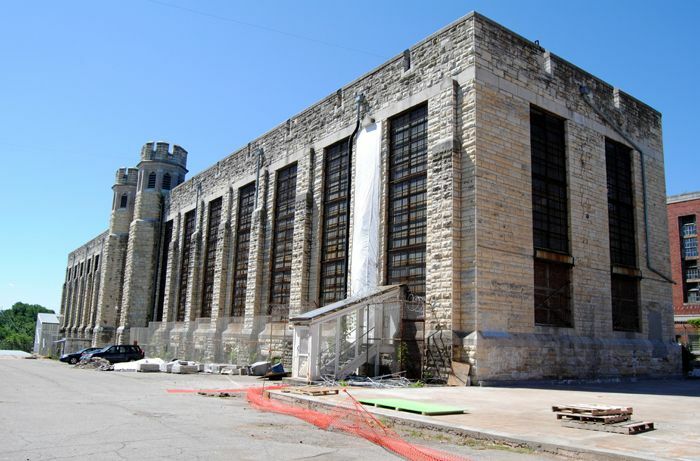 After 168 years of operation, the prison was closed in 2004 and the inmates were moved to the new Jefferson City Correctional Center. During its history, the facility contained as many as 50 buildings. After it closed, many were razed to make room for a federal courthouse and other state buildings. During its long life, thousands of inmates would call “The Walls” home, several of whom were well-known. In 1925, one of the prison’s most infamous inmates Charles Arthur “Pretty Boy” Floyd arrived, who was well-known for his widespread bank robberies and his involvement in the Kansas City Massacre. After Blanche Barrow of the Bonnie and Clyde Gang was captured in 1933, she was sentenced to ten years in the prison for assault with intent to kill. However, after being a model prisoner, she was released in 1939.